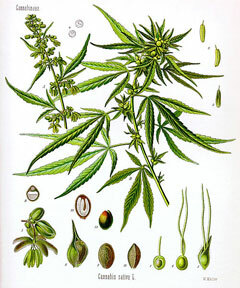 Hemp Seed oil is pressed from the seeds of the Cannabis Sativa, a flowering plant that is indigenous to central Asia and is now grown pretty much everywhere! Is especially good for mature skin and if often used to soften dry and irritated skin. Has a deep green color and a light nutty odour. Contains Vitamins A, B, D and E and is rich in fatty acids, amino acids and proteins. Used in acne, dry skin, dry hair, eczema and psoriasis products. Is a non-greasy emollient that penetrates easily. Said to increase elasticity, shine and manageability of hair. Helps to protect skin from excessive water and moisture loss. Saponifies slowly but produces a stable and conditioning lather in soap. This oil should only be used as a small percentage of the base oils because the high percentage of fatty acids make it vulnerable to spoilage.